How much does labor cost to remodel a house? Cost of man power is a second major expense after materials. It determines total expenditures on any home improvement project. In some cases, labor cost to complete installation, repair or replacement might exceed actual supplies expenses. Normally a contractor will adjust labor rates based on fair market value. There are always numerous factors affect the cost of labor and the same renovation project might be estimated with significant difference in price by a few remodeling contractors. Before making any conclusions homeowners should clearly define expected work quality for a certain budget set. But, in essence, no matter how homeowners wish the cost for completing each task presented total labor expenses will be based on charges determined solely by a contractor after analyzing scope of the work has to be performed. Work complexity and level of customization will affect the cost of labor at a first place. Projects which require minimum or can be completed with no certain skills at all by following simple instructions are the most cost effective in term of labor expenses. Man power expenses will depend on a geographic location. Some places tend to be more expensive in term living and property value as a result labor cost will be higher there. Simple home repair might be done by a local handyman who typically won’t provide you with a long term warranty, but normally will be the cheapest solution for a low budget home improvement. 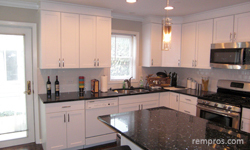 For bigger scales house renovation including building additions it is better to hire a remodeling company which does not only guaranty the quality, but will complete the work in timely manner. Small remodeling projects will be calculated at higher rates per hour, charge per square foot or fee per item installed. Many contractors have a minimum charge and couple hours of work might be estimated as equivalent to half or a whole work day charge. *Labor cost estimated as approximate expense of manpower and might vary significantly.